Rathlin Island, County Antrim is situated off the north east coast of Ireland. It is the only inhabited offshore island in Northern Ireland. 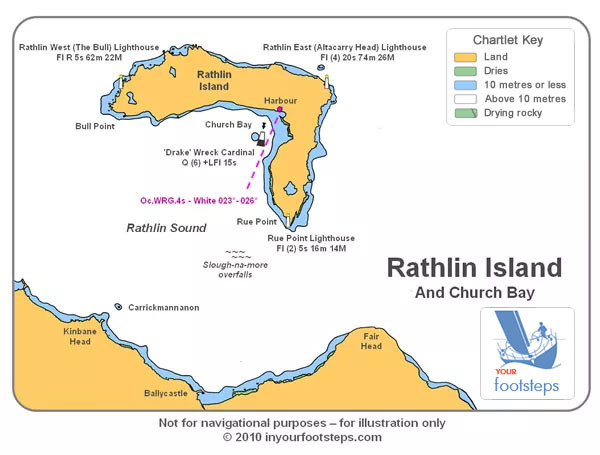 Most people will travel to Rathlin via the ferry service operating from Ballycastle, County Antrim, just six miles from the harbour on the island. It is quick and easy to get to the port, and quick and easy to get across to us on the island. Ballycastle, County Antrim is just over an hour's drive from Belfast and from Derry, and about three hours from Dublin. From Belfast, take the M2 north, turning off onto the A26 at Junction 1. Continue on the A26 northwards, bypassing Ballymena on another section of the M2. After about 20 miles, turn right onto the A44, through Armoy and on to Ballycastle. At the town, continue on down to the seafront and turn left, past the marina and on to the ferry terminal building at the top of the slipway. Nearly there! There are a number of bus routes to Ballycastle, with a stop at Marine Corner, close to the marina and ferry terminal. See here for details. 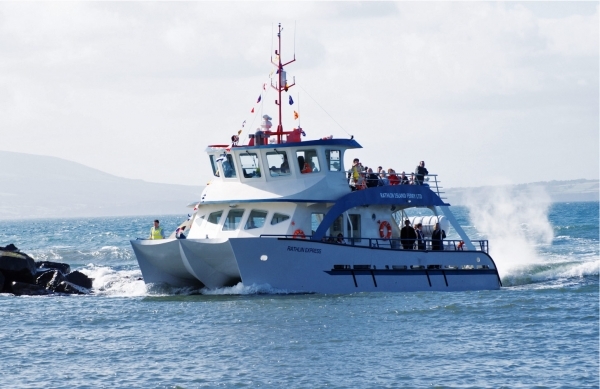 The ferry service operates from Ballycastle, County Antrim. During the summer season, there are up to 10 sailings in each direction and up to five a day during the winter timetable season. 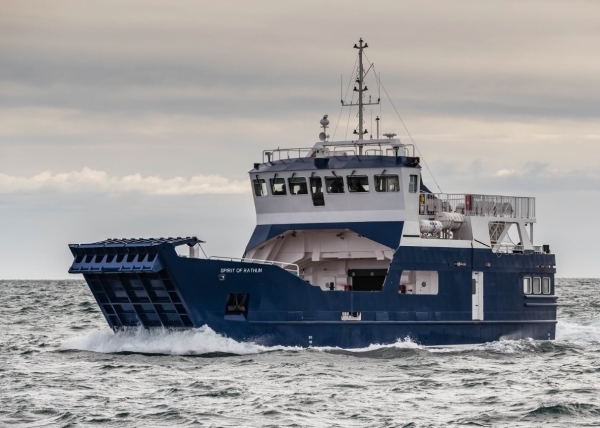 The crossings are served by two vessels, the passenger-only vessel MV Rathlin Express (taking 25 minutes approximately to cross), and the new car ferry the MV Spirit of Rathlin (40 minutes approximately), which was purpose-built for the Rathlin route, and replaced the MV Canna. The 2018 Summer timetable runs from Wednesday 28th March to Sunday 16th September inclusive. The passenger-only ferry, the Rathlin Express. Booking is very advisable, and bookings can be made in person, by phone or by email. Adult return - £12.00, Child (5 - 15 yrs) return - £6.00, family day return - £32.00, children under 5 and senior citizens with valid NI Smart Pass go free. Bicycles may be carried on either ferry for £3.30 return. Please note that there are restrictions on visitors bringing their cars to the island - contact the ferry company for details. The new car ferry, the Spirit of Rathlin. 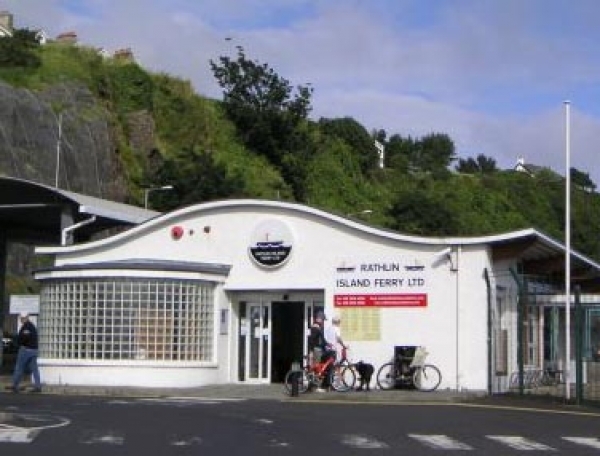 The ticket office in Ballycastle is open for bookings 08.30 - 18.30 in April, May and September, 08.00 - 18.30 in June, July and August, and 08.30 - 17.00 (closed for lunch 12.30 - 13.30) September to March. For further details contact Rathlin Island Ferry Ltd or call 028 207 69299. These charges are applicable to all private leisure vessels and small commercial vessels. These charges are only applicable to fishing vessels that have a valid fishing licence and certificate of registry. Detailed info on sailing into the harbour at Church Bay available here. 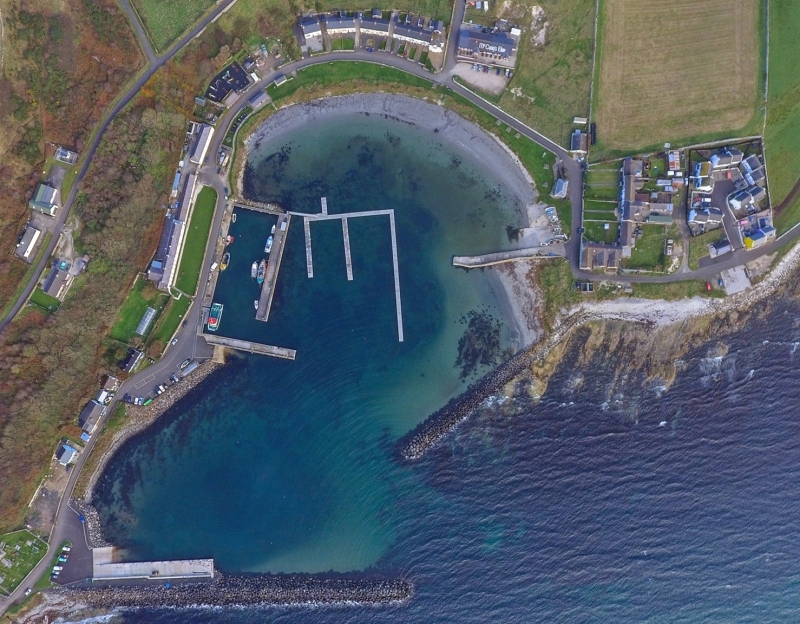 Marine Traffic's Port Calls, Arrivals & Departures page for Rathlin's harbour.